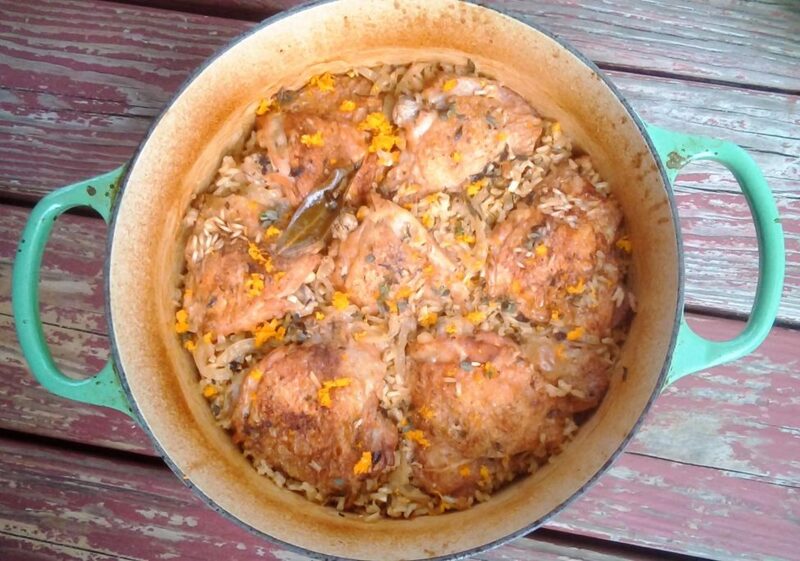 There’s something beautifully simple about a humble pot of chicken and rice. This workhorse of a meal is perfect for a lazy weekend and great for your budget, coming in at just over $1 per serving. In a large Dutch oven over medium-high heat, melt the butter and olive oil together. Season the skin side of the chicken thighs with 1 tsp. of salt and 1/4 tsp. of pepper. Working in batches to keep from overcrowding the pan, place the chicken thighs into the hot oil and butter skin-side down. Cook for 4-5 minutes, until the skins are very golden brown and crisp. Turn the chicken pieces over and cook for another minute on the other side. Remove the chicken pieces to a plate and repeat with the remaining chicken. Standing back from the pot, toss 8 of the thyme sprigs into the hot drippings. Fry the thyme for 1 minute, then remove the stems from the oil and discard. Add the sliced onions and garlic to the pot and cook, stirring, for 3-5 minutes, until soft and beginning to brown. Add the orange juice to the pot and stir, scraping any browned bits off the bottom. Pour the rice into the pan and stir to coat the grains of rice in the liquid and distribute the onions and garlic throughout the rice. Add the chicken stock to the pot. Season with the remaining salt and pepper. Add bay leaf and stir well. Nestle the chicken thighs on top of the rice mixture and pour in any juices that were left on the plate. Cover the Dutch oven tightly and bring to a boil. As soon as the liquid is boiling, transfer the covered dish to the oven. Bake at 375 for 1 hour, until the liquid is absorbed and the rice is fully cooked. Remove the lid from the pot and sprinkle the hot chicken and rice with the zest of the orange and the leaves from the remaining 4 sprigs of thyme.